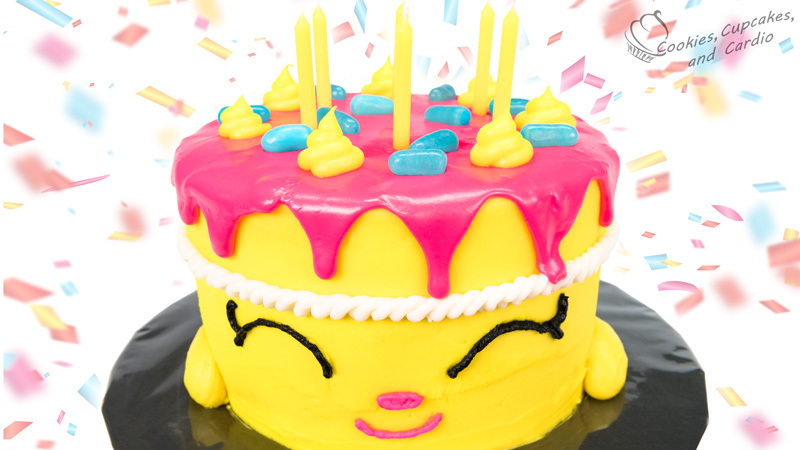 Any Shopkins fan would love an amazing Shopkins birthday cake for their birthday party. Central to that is a Shopkins Themed Birthday cake. This cake from Cookies, Cupcakes, and cardio is one of our favorites. 1.Prepare and cover cake in yellow buttercream. 2.Measure 2.5″ from the bottom of the cake, up the side and mark with a toothpick. Repeat all around the cake. Join marks with a line. 3.With the white buttercream, pipe a rope border around the cake at the 2.5″ line by piping upside down “C’s”. Repeat all the way around the cake. 4.Using a small round cutter, press a half circle into the cake, for the eyes (or freehand it). Trace line with black buttercream. Add one eyelash at the end of the eye line. 5.Using the pink buttercream with a 4/5/6 tip, pipe on a nose, and mouth. 6.Place 1 cup of pink buttercream into a microwavable safe bowl and cook in 15 second intervals until melted. 7.Pour melted buttercream onto the top of the cake, and gently push small amounts of the icing over side of the cake. 8.Using the yellow buttercream with the number 10 tip, pipe small cupcake topping like swirls around the outer edge of the top of the cake (6-8 of them). 9.Place blue Mike and Ike’s on the top of the cake for sprinkles. 10.Place candles in cake prior to serving. 11.Store the cake in a sealed container in the fridge and it is best consumed within 2-3 days. The below video includes additional info and step-by-step instructions so you can make your own wonderful creation. Please share this with other Shopkins Fans so they can get some inspiration. If you have your own cool creation, please share it on the facebook page so others can be inspired. We would love to feature some other amazing Shopkins Projects so please keep posting them on the facebook page.